(CNS): The premier’s decision to swap around areas of responsibility to accommodate his party colleague, Osbourne Bodden, and not remove him from Cabinet is unlikely to put an end to the 'Ozziegate' issue. Over 600 votes were cast in the CNS straw poll during the last five days and more than three quarters called for Bodden’s resignation. The outrage about the minister’s behaviour towards his chief officer, Jennifer Ahearn, has not abated and the shuffling of ministries and chief officers by Premier Alden McLaughlin has done nothing to appease the public outcry and calls for the former health minister to resign. A second poll on CNS indicated that almost half of the voters want to see him replaced by Alva Suckoo. When asked if Bodden should resign, 78% said that he should go. In a related poll asking who should replace him, 49% backed Suckoo, with Roy McTaggart emerging as the second most popular choice with 19% of the vote. Although not scientific, the online poll gives a snapshot of publicopinion. During the last week since the revelations that Bodden had publicly and loudly cursed at his chief officer in front of dozens of civil servants, it is the alleged nationalist slur that has caused the most concern. Bodden has not yet denied making the alleged comments deriding Ahearn’s Caymanian status, suggesting she was no more Caymanian than an “f^*#ing piece of driftwood”. Following a number of stories on this website relating to the incident, there have been almost 1,000 comments posted to CNS, with the vast majority calling for Bodden to go. Given the ongoing tensions in the community at present between the different expatriate groups, local people are feeling squeezed out of the job market at both ends. They see professional permit holders taking the top jobs in the finance ad related sectors, while cheap imported labour is taking the traditional posts held in construction and allied manual trades at the bottom. So the stirring of nationalist sentiments, with the popular perception that the PPM is less welcoming to ex-pats than its former political rivals, the UDP, is fuelling further concerns. The public seems to think that the premier should have acted quickly and decisively to remove Bodden, demonstrating an intolerance in his government of such sentiments. However, the complete silence from all government members about the outburst, coupled with the decision not to force Bodden’s resignation, has not proved popular with the broader public. The premier has now taken on Bodden’s major ministerial responsibilities and now has direct responsibility for heath as well as environmental health and the controversial dump issue. Meanwhile, Bodden keeps responsibility for youth and sports with the addition from the premier’s portfolio of community affairs but has lost culture to the premier as well. Not only has McLaughlin now taken on the more controversial portfolio, he has expanded the size of his ministry and is in danger of facing the criticisms that he hurled at the previous premier, McKeeva Bush, for taking on too many major ministries. When he was opposition leader, the current premier derided Bush as “minister for everything” after he took on finance, development, tourism and financial services as leader of the UDP administration. McLaughlin has retained his home affairs ministry, which includes the prisons, police and immigration, and has now taken on two more politically sensitive areas in order to protect his Cabinet colleague. This is a decision that many commenters, not just on CNS but across the local media, say the premier will come to regret. McLaughlin could have turned to several of his backbench MLAs to take on Bodden’s ministry intact, in particular Suckoo, who won the support of the majority of CNS readers. But the decision has been made, and while the premier may be hoping the matter will go away during the holidays, the populist outcry is unlikely to die down that quickly. The continued silence from Bodden himself as well as the rest of Cabinet about the alleged derogatory comments is not helping. CNS is still waiting for the gender affairs and labour minister, Tara Rivers, to comment, given that this is a workplace issue involving gender. (CNS): One of four men charged with an armed robbery at Blackbeard's liquor store last week made a bid to escape from the court Monday afterhe and his co-accused were refused bail and remanded in custody until their next court appearance in the New Year. Police confirmed that two officers were slightly injured during the escape attempt by Devon Wright, who leapt over the court dock rails and headed into the court house foyer. The incident happened around 1:30pm, when Wright (23) appeared with Andrew Lopez (21), Bron Webb (21) and Randy Connor (24) before Magistrate Valdis Foldats. Police chased Wright and he was quickly detained and taken back to the courthouse cells. 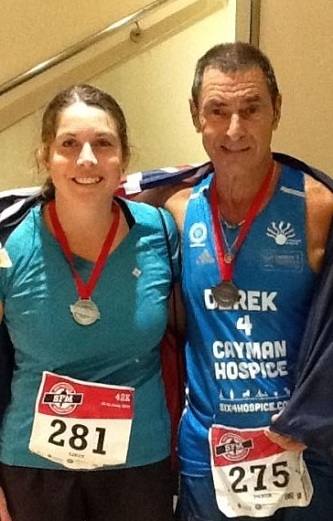 (CNS): Cayman’s veteran marathon runner and local hero, Derek Haines, who raised over $1 million for Cayman Hospice by running six marathons around the world this year, became the victim of a burglary in South Sound yesterday lunchtime, along with at least two of his neighbours. Even though Haines has an alarm and other security measures, the burglars broke a window and, with the alarm sounding, helped themselves to a substantial sum of cash (a fund Haines was saving for a climbing trip with his daughter) and electronics, including laptops, iPads, phones and jewellery. However, Haines said his medals were safe and there was no cash in the house that had been raised for the Hospice. A former chief superintendent with the RCIPS, Haines warned the community to be vigilant over the holidays and watch other people's properties because the burglars are brazen and do not care. Despite the alarm and other security measures, the burglars seem undeterred and simply smashed the window right next to the security system sticker alerting would-be villains to the alarm, Haines told CNS. Nevertheless, at around 1:40 in the afternoon, with the alarms wailing, the culprits managed to make off with the loot from Haines’ home and at least two others in the neighbourhood. Hoping that he might be able to recover some of the property stolen, some of which belongs to family members who are visiting home for the holidays, he asked people to contact the police if they are offered cheap electronics. Haines said that following the incredible community effort to raise the cash for Cayman Hospice, it was a terrible shame that there are individuals who are preying on good people. 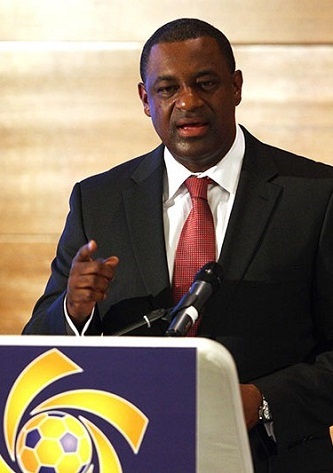 (CNS): President of CONCACAF, Jeffery Webb, is back in the spotlight regarding the possible top job at the international football body, FIFA. As scandal and skulduggery continue to plague the sports organisation and Sepp Blatter’s re-election remains in question, Webb’s name has re-emerged as a possible contender for the FIFA presidency. Candidates for the election next year must submit their intention to stand by 29 January, and according to reports on the BBC, while Blatter may be running again, he has not yet decided and if he doesn’t, Webb, Cayman’s own football boss, may be tipped to as his successor if he throws his cap in the ring. According to the BBC, secret talks between FIFA officials and Sepp Blatter have taken place over his future and if Blatter decides he will not run, FIFA insiders are pointing to Webb as one of the main contenders. Appointed president of CONCACAF in 2012 in the wake of the financial scandal involving the former vice-presidents, Chuck Blazer and Jack Warner, Webb has since stabilised the organisation's finances and led the anti-discrimination taskforce, which has introduced tough new sanctions for racism offences within the game. Webb has said he doesn’t plan to run for the presidency this year, with many expecting him to target the 2019 poll. But as the pressure on Blatter continues to build, and given the recent haemorrhaging of FIFA's credibility, Webb is believed to be considering his options, the BBC said. Blatter has praised Webb in the past and lauded his efforts to reform Caribbean football. With five weeks to go until the deadline for presidential candidates to formally declare their candidacy, it is thought that Blatter's actions backing the redacted publication of the Michael Garcia report when the current investigations have concluded has provided him with sufficientpolitical breathing space to make it onto the list of nominees. The latest crisis to hit FIFA stems from the investigation into alleged World Cup bidding corruption that culminated in the resignation of ethics committee investigator Michael Garcia. He is claiming a lack of independence in the association’s judicial processes and a belief the organisation's culture was beyond reform.